Please join the Mount Carmel family in welcoming Ann Marie T. Brooks, PhD, MBA, RN, FAAN, FACHE, FNAP, as interim president for Mount Carmel College of Nursing. Dr. Brooks, who starts on Monday, June 26, 2017, will serve in this role for approximately one year, as a nationwide search for a permanent president is conducted. 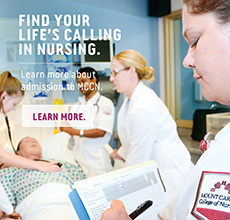 Dr. Brooks' appointment was recommended by the MCCN search committee and approved by the Mount Carmel College of Nursing Board of Trustees. Dr. Brooks is a recognized international leader, consultant and educator in nursing and healthcare with broad strategic and operational experience in health systems, academic health centers and community hospitals in the United States and abroad. She has extensive board experience from serving as the president of the American Organization of Nurse Executives and American Psychiatric Nurses Association, chair of the Psychiatric and Mental Health Governing Board, and dean of The Catholic University School of Nursing. The College experienced another record-breaking Commencement, as 281 members of the Class of 2017 earned Bachelor of Science in Nursing or Master of Science degrees. And, we were honored to have Columbus Mayor Andrew J. Ginther as keynote speaker for the Commencement ceremony. On Saturday, October 21, the 2017 Mount Carmel Alumni Association Annual Meeting and Homecoming will be held at the College from 10 a.m. to 3:30 p.m. The Class of 1967 is our 50th anniversary class; honor classes are those whose graduation years end with a 2 or a 7. Members of the Mount Carmel Alumni Association Board, left to right, are: Seated – Karen Klarman Durano ('75), vice president; Stephen Pearson ('15), president; Cheryl Mace ('75), treasurer; standing – Pat Steele Skunda ('72, '10 and '14), secretary; Iris Beery Freisner ('66 and '07); and Phylis Motz Crook ('63); unavailable for photo – Sandy Gehres Parker ('97); Melissa Stacy Cull ('05, '12); Deidra Filarski Weatherby ('08, '13); and Debbie Dunn Boggs ('75), ex officio member and director of Alumni Relations. Other degrees/credentials: In 1969, I took a refresher course at Grant Hospital before coming back to work after my children were in school. A Mount Carmel graduate, Nancy Burns Roux, taught the course. Professional Highlights: As a student, I did a lot of things for Sister Joan Marie, which included working on St. Brendan’s, which was the senior floor where all the nurses took all of the positions including head nurse and charge nurse. I loved working up there because it was small and you got to do everything. Sister Joan Marie had started that floor and she also started the recovery room, so I worked for her there when it was newly organized. I was hired in the ER and worked until my oldest son was born in 1955. I went back to Mount Carmel after the refresher course in 1969, and then moved to Arizona in 1973. There I was hired at a Scottsdale hospital where I worked in ambulatory care for 10 years. After that I was in home care, hospice and private duty nursing, but during summers when census was low I was a camp nurse all around the country, including one summer on the North Rim of the Grand Canyon. I retired in 2003.